Vitamin C (also known as ascorbic acid) is one of the most common nutrients. It has powerful antioxidant properties and is needed for wound healing, repairing tissue, iron absorption, scurvy prevention and protecting heart health. The amount of vitamin C you need will depend on your age and gender, ranging from 40 mg to 120 mg per day. It is commonly thought that citrus fruits such as oranges and lemons are the only sources of vitamin C, but this is not the case. 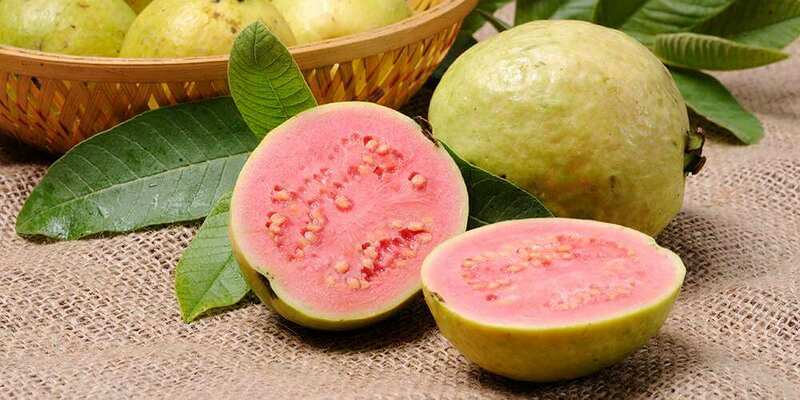 There are in fact lots of fruits and vegetables you can eat that will provide you with significant quantities of vitamin C.
The guava is a fruit that you may not have come across. It is native to Mexico and South America and is cultivated in tropical & subtropical regions. The fruit has a green outer rind and pink inner flesh, and may be available at a grocery store near you. Guavas contain a large amount of vitamin C; a single fruit will provide you with all of your daily requirement of vitamin C. Guavas also have smaller quantities of many important vitamins and minerals, making them a healthy addition to your diet. You can eat guavas on their own or include them in salads and desserts. Also known as the Chinese gooseberry, kiwifruit is oval in shape with a thin brown outer skin and soft green inner flesh, as shown in the image above. It is another fruit that provides you with more vitamin C than an orange when compared weight for weight. Kiwifruit also contains large quantities of vitamin K, a vitamin that is most commonly found in leafy green vegetables. Kiwifruit is a great ingredient to use in smoothies. For example, this smoothie (which is aptly named “Vitamin C is good for me”) contains kiwifruit, guava and some other vitamin C rich fruits and vegetables. Papaya is a delicious tropical fruit that is loaded with nutrients, antioxidants and other powerful substances. Studies have found that these substances may be beneficial for reducing inflammation, fighting off cancer, improving heart health and protecting the skin. Papaya also contains an enzyme called papain, which can help with protein digestion. Most orange coloured foods found in nature are excellent sources of vitamin A, and papaya is no different, providing you with a third of your daily requirement. Papaya is also a good source of potassium, folate and vitamin E.
Sweet and succulent, the strawberry is a brightly coloured red fruit that is enjoyed the world over. Because strawberries are made up of more than 90% water, a cup of them only has 49 calories. 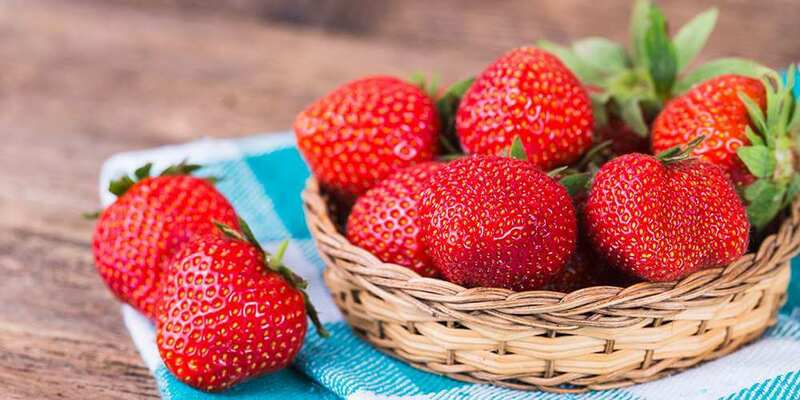 This, combined with their moderate sugar content makes them a fantastic fruit to have when trying to lose weight, especially if you have a sweet tooth. Strawberries can be enjoyed in all sorts of ways. For example, combining them with Greek yogurt makes for a filling protein rich snack. You can also freeze them and make a healthy homemade sorbet that you can enjoy as a dessert after a meal. If you have ever bought a vitamin C supplement, it is very likely that parts of the packaging were orange in colour, or it had a picture of an orange somewhere on it. This is because the orange is the fruit that is most associated with vitamin C, and for good reason; they are packed full of it. There are many varieties of orange available, including mandarins, clementines and tangerines, all of which have a lot of vitamin C. Orange juice is also high in vitamin C, providing you with more than 100 mg per cup. If you are going to be drinking orange juice, your best bet is to prepare it fresh at home, so as to reap all of the benefits that this fruit has to offer. Even though lemons are not sweet tasting, they are still technically a fruit, resembling oranges in a lot of ways. 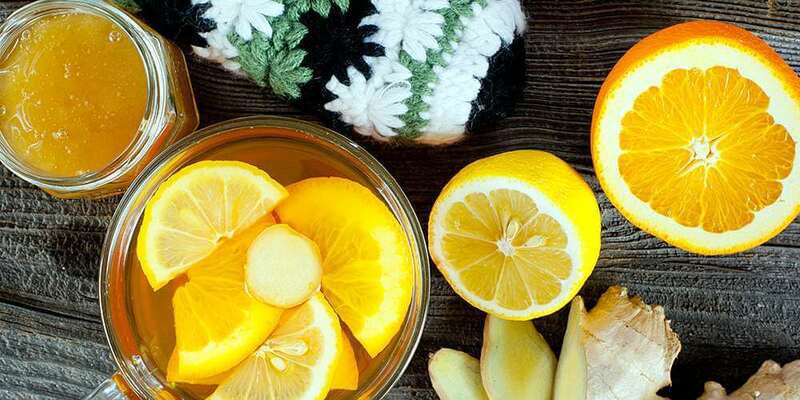 When people fall ill, they are often advised to regularly drink hot water combined with lemon, ginger and honey. This creates a powerful vitamin C rich tonic that may help to reduce the severity of symptoms associated with the common cold. The great thing about lemons is that they can be incorporated into all sorts of dishes. Whether you use lemon juice as the base for a marinade or squeeze it over grilled fish, there’s plenty of ways to include it in your diet. Another vibrantly coloured fruit, it is a source of bromelain, a protein digesting enzyme only found in pineapples. This enzyme has been linked with a variety of health benefits, including reduced inflammation, cancer prevention and improved gut health. The pineapple is a very versatile fruit that can be included in smoothies, jams, stir fries and desserts. Buying fresh pineapple would be the best option, but if it’s not available where you live, you can opt for the canned variety as well. A type of melon, cantaloupes have an impressive nutritional profile, being a source of vitamin C, potassium, magnesium and manganese. These fruits are most popular during the summer, but are usually available year round. One study found that the beta carotene (a powerful antioxidant that is converted to vitamin A in the body) content of melons like cantaloupe was comparable to that of carrots. So be sure to eat this fruit regularly. A truly delicious and refreshing fruit, the mango is a rich source of natural sugars, fiber and vitamins A, C & E. It is another fruit that can come in handy when trying to lose weight because it is low in calories and very sweet tasting. There are quite a few cultivars of mango, most of which have a high sugar content. Like with the fruits mentioned previously, mangoes can be eaten on their own or added to salads, smoothies and desserts. Grapefruit is another tropical citrus fruit that is well-known for its sour taste. The consumption of grapefruit may be beneficial for the immune system (thanks to the vitamin A and C it contains), insulin level control, heart health and weight loss. If you find grapefruit to be too sour tasting for your liking, eat it together with sweet fruits like mango and pineapple. Besides the fruits mentioned above, there are others that have vitamin C in lesser amounts. Including these fruits in your diet is a good idea because eating them helps to increase your overall intake. The table below compares the vitamin C content (in mg) of 100 g of various fruits. To discover even more vitamin C rich foods, check out this page.